For all practical purposes, my portion of the customization project is done. Last week, I made some minor adjustments worked on a couple of other bugs as I waited for my coworker to wrap up his end of the project, which was to migrate the clients' settings from a file system repository to a database. He hit several snags along the way, which resulted in a delay in the migration to the next release, which is on Wednesday. There is still a small cluster of bugs relating to the handling of post comments, but they are more annoyances than critical issues. They will get resolved on a maintenance schedule in the near future. Today, our development team met with some higher ups to plan for the next project, which will be run under a full-blown scrum system, complete with backlogs, sprints, and daily meetings. For the last month or so, we've already been operating under a limited form of this with the sprint backlog and daily meetings. What we lacked was the coordination that scrum requires from stakeholders. Starting with today's set of meetings, we are now operating with the buy in from both the strategic and service sides of the company, which is a good thing. This past weekend was special for a couple reasons. First, it was the first time in almost a month and a half since I'd had a weekend where I didn't have a boatload of things to work on. Second, it was the first weekend I've had where I was alone. My wife and the kids left for the Volunteer State on Thursday morning. On their schedule was the wife's best friend's daughter's wedding and some tourism. I kept busy by getting chores done. The lawn was looking awful because I hadn't mowed it in three weeks. The house was aclutter. My wife had baked the multitier wedding cake and made the icing so that she could take it with her to decorate, so the kitchen was a mess. The laundry backlog stood at five loads, with a wet load left in the washer and three or four loads of clean but unfolded clothes. By the time they returned on Sunday afternoon, the house was looking pretty good. In the midst of the silence, serenity, and solitude, a realization hit me... Work had engulfed so much of my mental energy that there was little room left for emotional awareness. I was able to put work aside for a few hours each day for the time I spent with my kids, but otherwise that was it. Without them around and without the need to work on code, I felt... depleted. Under all of the borrowed functioning supplied by my work and my kids, there wasn't much else to keep me going. I searched the local entertainment papers to see what music was playing in town, but didn't find anything appealing. I did manage to spend a few hours at my coffee shop, which helped. In retrospect, I should have booked a massage at the massage school, but that's 20/20 hindsight. I think another thing that leaves me sapped is the status of marital limbo. My wife won't be moving out until sometime in the summer, so our lives still have a high degree of integration. If I'm not at work, I'm almost always at home watching the kids. I'm want to start building a social network of my own, something that extends beyond work. In another week it will be a year since my wife and I did anything sexual, so that also doesn't help much. This weekend was a wakeup call for me. While things have gone well at work, and there will be more challenges and rewards ahead, I have been neglectful of the full breadth of my emotional needs. I can't expect to let my work be my emotional fuel because if I go through a rough streak, there won't be much to hold me together. Following the advice of Drunken Housewife many moons ago, I'm going to get put on medication because I won't have the strength to make it through the strains of separating. The image above was a therapeutic exercise. You can view a higher resolution version of it by clicking on the graphic. 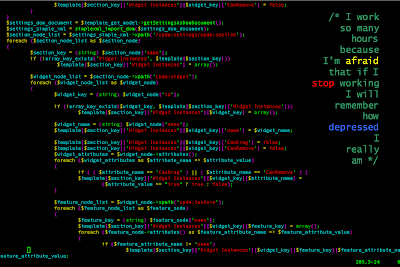 To make it, I took a screen capture of some of the most complicated source code I had worked on the last few weeks. I juxtaposed it with a text overlay, a statement of my feelings over the weekend. The source code editor is aware of the underlying language and color codes the text based on the underlying function of the text. The overlay text is written as a programming language comment, with words color highlighted to convey meaning. I thought about printing it and sending it to PostSecret, but I thought it would be better to get this out into the open.